Thiessen moved with her family to Omaha, Nebraska when she was ten years old. By fourteen, she was already helping to support her family by working as a dressmaker, which she continued until ready-made dresses gained popularity. 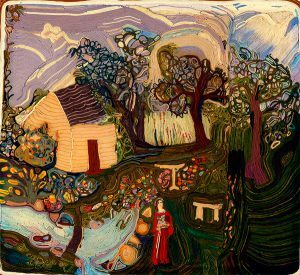 Other than her marriage to Charles Leonard Thiessen of Grand Island, little is known about this Nebraskan Artist, a common misfortune with many folk artists who live and work in relative obscurity. Jean Thiessen is the mother of Leonard Thiessen, a well-known Nebraskan painter.